Discover why I chose the Pioneer PLX-1000 over the legendary Technics SL-1210 turntable, and enjoy a battle between the two. The battle of the DJ turntables is on! Pioneer PLX 1000 VS Technics SL 1210. A legend and the industry standard turntable against a newcomer that looks.. Ummm.. Very similar!! I think we have a copycat in our midst. But can the Pioneer PLX 1000 hold it's own against the favourite among DJ's and turntablists? Let's find out. The Technics SL 1200 was first introduced way back in 1972. It wasn't intended specifically for DJ use but as a high fidelity consumer record player. The powerful direct drive motor soon attracted mobile and radio DJ's that needed such a turntable for push button cueing. In 1979 after a successful 7 years, the Technics SL 1200/1210 MK2 that we all know and love was launched. This model now featured a pitch slider as opposed to a rotary pitch control on the original model. This allowed easy beatmatching and was soon adopted by New York Hip-Hop DJ's like Grand Wizzard Theodore the pioneer of scratching. Many other models followed but the SL 1200/1210 MK2 remained the most popular amongst DJ's. Production of the SL 1200/1210 MK2 continued until 2010 when the whole series was discontinued. 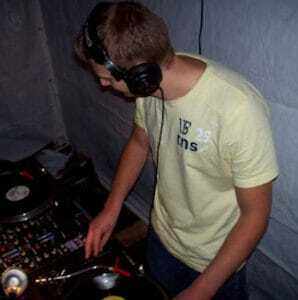 The use of turntables is still very popular amongst scratch DJ's and turntablists. This lead to a petition to re-launch the SL 1200/1210, which Technics accepted. Unfortunately the Technics SL 1200G was given a hefty price tag and comes in at over $4000 per turntable!! This put it way out of reach of most people but Technics responded by scaling down to the new SL 1200GR. This version is still pricey and is currently selling at $1700 per turntable. The SL 1200GR is a great turntable but it received mixed reviews. The general thinking is that it's more of an audiophiles turntable and is not really aimed at the modern DJ. We may never get a dedicated DJ turntable from Technics, so if you want to buy an SL 1200/1210 you'll probably be buying second hand. Although there are still new MK5G's for sale on amazon, but they're expensive! And that's exactly why Pioneer are now leading the way with the Pioneer PLX 1000. There's no escaping that fact that the Pioneer PLX 1000 has been designed with the Technics SL 1210 in mind. 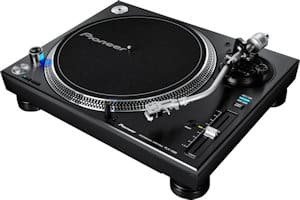 I think we'd all agree that Pioneer saw the gap in the market and jumped at the chance to produce an industry standard turntable. One that DJ's would look at and feel familiarity, and one that could take over from the Technics SL 1210. They're almost identical in many ways, which we'll go into shortly. But they come with a much more sensible price tag. The last time I checked you could get two Pioneer PLX 1000's for the price of one Technics SL 1200GR. Or a set of two for around the same price as a set of used Technics SL 1210 MK2. But are they as good as the original DJ turntable, the Technics SL 1200/1210 MK2? Will the one's and two's be replaced by Pioneers PLX 1000 in clubs and home set-ups anytime soon? And will we be seeing then used at turntablist competitions like the DMC championships in the future? Let the battle begin! The battle begins: The weigh-in. When you compare the two turntables you will see that the similarities go further than just visual. Both turntables have a die-cast metal chassis and are almost identical in size and weight. This has made the Technics SL 1200/1210 MK2 very durable and impact resistant. I've heard stories of people dropping them down stairs as they carry them into gigs and having no problems powering them up after. So Pioneer have obviously designed the PLX 1000 with this in mind. Pioneer PLX 1000: Width 45.3, Depth 35.3, Height 15.9, platter 332 mm, Overall weight 14.6 kg. You'll notice that the Pioneer PLX 1000 is 0.6 kg heavier. Scratch DJ's and turntablists will be happy with this. The extra weight will ensure that the turntable will stay in place during long routines. It will also make needle skipping from knocks less likely. The torque that a DJ turntable is able to offer is one of the main deciding factors when purchasing. You'll need a motor capable of keeping the platter spinning at the correct RPM for cueing and scratching records. This is one of the things that originally attracted DJ's and turntablists to the Technics SL 1210 MK2. Its powerful direct drive quartz controlled motor was able to hold the beat and reach the desired RPM in record time. Unfortunately for the Technics SL 1210 MK2, the newcomer will outshine the favourite in this round. Pioneers modern motor is able to offer much higher power with higher torque and quicker platter start times. Both turntables offer the ability to play 33 RPM and 45 RPM records. But the Pioneer PLX 1000 will also offer a wider pitch range. The Technics SL 1200-1210 will only offer a +/- 8% pitch range. The Pioneer PLX 1000 offers an option of +/- 8%, +/- 16%, or +/- 50% with a reset button. 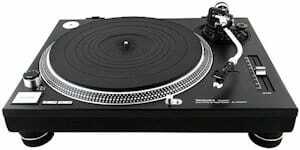 The Technics SL 1200/1210 with it's +/- 8% pitch range will suit most oldskool DJ's that spin vinyl and scratch. Or even DJ's that tend to stick to one genre of music. But the extra range offered by the Pioneer PLX 1000 will attract DJ's that play a variety of genres. Digital DJ's using programs that combine encoded vinyl may also enjoy the extra options. 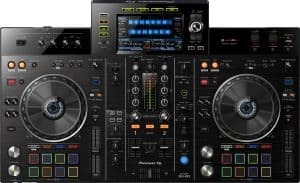 If you're unfamiliar with digital DJing or DVS software see my article comparing the best two programs on the market HERE. The extra fast speeds may make your tracks sound like a song from the chipmunks movie. Or slowing them down might make people think your turntable is broken. But digital DJ's will be able to use special features to stop this. The key lock feature in Pioneers own Rekordbox DJ is a very handy feature. Once you enable it the extra speeds won't affect the tone of your music! This allows you to mix super fast tracks to very slow BPM's. When the breakdown drops you can hit the turntables reset button. This will instantly take the track back to playing at its normal speed. First up we see that the Pioneer PLx 1000 has a set of RCA (phono) outputs with a separate lead. A ground connection and a power connection, also with a separate lead. Having separate leads on turntables that will be gigged or transported a lot is important. It doesn't take long for leads to break when they are constantly flexing and being pulled to unplug them. Pioneer have thought ahead by including built in connections and detachable leads with the PLX 1000. The Technics 1200/1210 MK2 has no terminals on the rear. The RCA leads and the power cable are both wired into the unit. Technics can be forgiven as this wasn't built as a DJ turntable. It was only meant to be sat in your living room next to the TV banging out the golden oldies. Unfortunately when the 1200/1210 is gigged a lot these cables can fail. Not to worry though as you can take the turntable apart and replace them. But the connections are soldered so you better be handy with a soldering iron. If not you'll have a bill to get them changed professionally. They'll be fine for the bedroom DJ that doesn't move the units around much. The problems only occur when the leads are being unplugged a lot. But even if they are being gigged their leads will last quite a long time. 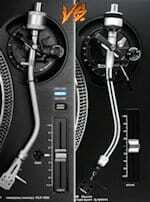 Both turntables use an S-shaped tonearm with a mechanism that looks almost identical. It includes anti skating, height adjust with a locking lever, and a lever to lift the tonearm. There's also a clip to prevent the tonearm from jumping off its rest and destroying your stylus. This could happen in transit or from a simple knock. Both turntables are supplied with headshells that use a four pin connector. These are readily available meaning you can easily replace them. Or you could swap them for a quality all in one cartridge like the Shure Whitelabel. Or if you're into turntablism or scratching the Shure M44-7. Both of these are available on Amazon here -> Shure Whitelabel and here Shure M44-7. Pioneer PLX 1000: S shaped tone arm, height adjustable, anti skate. Other notables - Effective arm length 230 mm, Overhang 15mm. Technics SL 1210 MK2: S shaped tone arm, height adjustable, anti skate. Other notables - Effective arm length 230 mm, Overhang 15mm. Pioneer PLX 1000 VS Technics SL 1210 - Final round! This is it, the last round and things are getting tense! So what about the price? Obviously the Technics SL 1200/1210 MK2 is no longer in production so you'll be buying second hand. I've been watching closely and the used price has been steadily increasing. At the time of writing you'll be looking at around $400 - $700. This depends on the condition and whether they have been refurbished. Vinyl is slowly gaining popularity in the commercial market and many DJ's are edging towards DVS control. This is pushing the price up so if you want a pair, get in there now. But buy wisely, some of these have been abused. All parts are readily available and you'll have no problem repairing them, but if they need repairs the price should reflect this. The last time I checked the Pioneer PLX 1000 was coming in at under $700 brand new. So you'll be paying very similar prices for the two choices. That's it, the battle of Pioneer PLX 1000 VS Technics SL 1210 MK2 is over. So who's it going to be, the legendary Technics SL 1200 or 1210? Or the modern purpose built Pioneer PLX 1000? Ultimately the choice is yours, but going by the figures Pioneer wins and I personally agree with that. The standout features that make the PLX 1000 the winner is the extra torque, and the detachable leads. The other extra features of the Pioneer don't give it a massive advantage and would only appeal to certain DJ types. But if I was buying turntables again which would I buy? I find this a very hard choice, but I'm still choosing the Pioneers as my favourite. I love scratching and the extra torque is appealing. I'd also be put off a little by second hand turntables. If I was on a very tight budget I would probably go for a used pair of 1210's that needed refurbishing. You could probably get a set for $800, but I'd be very fussy and probably view lots before buying. As for buying blind on sites like eBay, I'd definitely advise against it. Take your time, do the research, go to view them, and thoroughly test them before exchanging money. Good luck with your decision and have fun with your new turntables. Let me know which one you chose in the comment section below. As a modern DJ you'll also be interested in my timecode vinyl/digital vinyl system article HERE. To find out some advanced DJ tips and tricks click HERE. If you don't like the sound of using a laptop whilst DJing check out all of your options HERE. Congratulations on the analize … My only concern is with the usage time. My technics are with me for 20 years … I changed the pitchs recently … just maintenance … Will the plx 1000 resist so much ?? ?